I know I have done this a lot lately... but with all the many DVDs that has been given to me lately... My Unwatched pile became completely and totally out of control! I now have 359 movies in my unwatched pile! As always... below is a list of the movies I have on DVD but not yet watched. Well... not since getting them on DVD anyway. Some of them I have seen before... and then got the DVD after seeing it. Those I will most likely save for another time. But if you have any suggestions let me know. I won't promise to get to them this weekend as there is some I already have in mind to watch this weekend... but I will see if I can fit them in. ALSO KEEP IN MIND... I AM STILL NOT WATCHING HORROR... SO NO HORROR PLEASE! 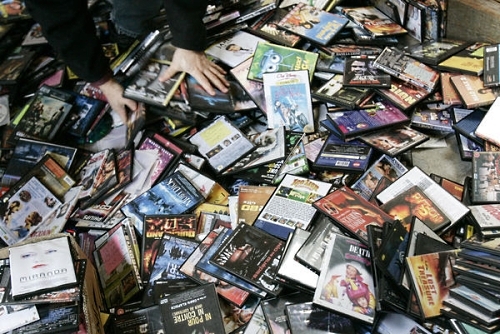 Aren't these marathons supposed to reduce your unwatched pile? Then how come every time you start a new one, it just gets bigger? While that is the idea... it hasn't worked that way for me. At least not in the last month! But I definitely can't complain! Only thing better then DVDs.... is Free DVDs! Jesse W. Haywood graduates from dental school in Philadelphia in 1870 and goes west "to fight oral ignorance." Meanwhile stagecoach robber Penelope "Bad Penny" Cushing is offered a pardon if she will track down a ring of gun smugglers. She tricks the bungling Haywood into a fictitious marriage as a disguise, and he becomes the heroic "Doc the Haywood" after he guns down "Arnold the Kid" and performs other exploits with Penny's help (unbeknown to him or anyone else). 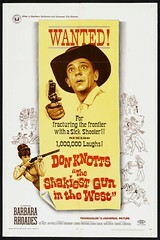 I have this movie in the boxset Don Knotts: The Reluctant Hero Pack. Going into this one I thought I seen it before. But I think all I ever caught before was a couple scenes here and there. It is a pretty good old comedy. Though I have to admit I was expecting a little more from it. Sure it had some good laughs in it. I just thought there would be more of them. I didn't even recognize Pat Morita in it. But being a movie that is over 40 years old I guess that is to be expected. Then there was an innkeeper that looked very familiar when I saw him... turned out it was William Christopher (Father Mulcahy on M*A*S*H). It is the first time this happened with the DVD Player I have now... but this DVD just refused to play in my machine... though it played perfectly in my computer. I never seen the other 2 in this set... The Reluctant Astronaut and [/i]The Love God?[/i]. So don't know what to expect from those. Walt Disney Pictures and Walden Media present C.S. Lewis' timeless and beloved adventure. Now — with stunningly enhanced special effects — you'll experience the exploits of Lucy, Edmund, Susan and Peter, four siblings who find the world of Narnia through a magical wardrobe while playing a game of "hide-and-seek" at the country estate of a mysterious professor. Once there, the children discover a charming, once peaceful land inhabited by talking beasts, dwarfs, fauns, centaurs and giants that has been turned into a world of eternal winter by the evil White Witch, Jadis. Aided by the wise and magnificent lion Aslan, the children lead Narnia into a spectacular, climactic battle to be free of the Witch's glacial powers forever! I originally wanted to watch this movie with my daughter. But when I mentioned it to her... she showed no interest what so ever in seeing this one. I even tried showing her the trailer when I got it... but she just was not interested. I personally enjoyed this movie. The storyline... while I knew it since I had to read the book in school... was fun. The effects were done well... and I liked pretty much everyone in it. I really can't say how this compares to the book... as it has been many years since I was in school... and I haven't read it since. I do wish Brittany would give this movie a chance. But I know that she won't... seeing the length alone will discourage her. A young widow of a marine killed in Vietnam learns to move on after getting a job with the director of the base's rec center. This is a TV Movie in a boxset that was given to me. It is a boxset of TV Movies from the '70s and "80s called Life Love and Romance: 12 Films of Intrigue and Passion. I wanted to check this one out because I grew up watching One Day at a Time with Valerie Bertinelli who stars in this movie. But there is a couple other familiar faces in this one as well. Craig T. Nelson and Shelley Long. As you could probably tell from the overview.... this one is pure drama. Heavy on the emotions. But it is pretty good. Some things in the story seemed to move pretty fast while other things were a little on the slow side. But I really liked Valerie Bertinelli in it. Thought she did a fine job... and she was as cute as ever in it. Being a friend of black (and strange) humour, I'd recommend "American Psycho"
Christian Bale is doing an amazing job here. That is good to know... but I was under the impression I had to wait till October to watch that one. The friend that gave it to me listed it with the horror she was sending me for October... and DVD Profiler has it as horror as well. I would recommend American Psycho too but that might qualify as horror so he will need to wait until his October marathon. Depending on what genre you are in the mood for, I think you would enjoy: Bad Girls, Black Hawk Down, Cinderella Man (another sport movie based on a true story), Dolores Claibourne, Duplex, A Knight's Tale, and The Matrix. A few to watch with your daughter: Fever Pitch, King Kong, Mary Poppins, Mona Lisa's Smile, Nim's Island, Pinocchio and Star Trek. I am planning on watching Nim's Island this weekend with Britt for sure. I will show her the other titles to see if she is interested in them. I was surprised she didn't want to watch Chronicles of Narnia! I remember seeing the trailer to the first Chronicles of Narnia in a theater. It looked very impressive to me, though I never wound up seeing it. I am planning on watching Nim's Island this weekend with Britt for sure. Watched it the other day on TV and found it slightly amusing. With this cast I had expected a lot more. Especially Jodie Foster can do a lot better than she shows here, Breslin is playing the cute little girl (as usual) and Butler is only good in the sequences where he is the imaginary hero Alex. The whole movie reminded me of "Pippi Longstocking". And I'm still trying to find out why in Hollywood's POV authors must be agoraphobic.